The report is based on 90 days(09th March ,2011 to 9th June 2011)Working experience on Al-Arafah Islami Bank Ltd(AIBL)I was assigned in the Motijheel Cor. Branch, Dhaka Of AIBL.This report gives a clear idea of the activities, operation strategies and the performance of AIBL’s General Banking activities. General banking department is the heart of every banking work. It does the most important and basic work of the banks. General banking is the Starting point of the banking Operation that starts on account opening and end on account closing. All other department are linked with this department. The Internship program gave me an opportunity to have an exposure to the working environment and on-the-job experience at Advance and General Banking department of Al-Arafah Islami Bank Ltd. I have learn and work a lot to know the General Banking and get the relevant data to prepare the report. Face to face conversation with the bank officers & staffs. Worked with every employee. Conversation with the clients. Knowledge when I was served. Discuss with the officers. Different manuals of AIBL. The Introduction of the topic “General Banking Activities of AL-Arafah Islami Bank Limited .”and the origin, objectives , scope of the report, types and sources of information, methodology & limitations of the report. And is about Al-Arafah Islami Bank Ltd, its history of success, Corporate information, visions, missions, objectives, financial performance of AIBL. The general banking activities of AIBL where there is an introduction of General banking, it’s functions, of the bank and a discussion about various types of accounts of this bank and other general banking activities. General banking procedure of AIBL. and function of various department of AIBL. And also designed with some ratio analysis of the bank according to the financial statement. Findings, recommendations as well as the conclusion have been described in this report. The reason behind choosing this bank is that, recently the Managing Director of AIBL Bangladesh has given emphasis on better customer service and more customer satisfaction and thus the customer service officer wants to get an idea of the current level of customer satisfaction at AIBL. Various products and services is the heart of banking system as it is in AIBL. It is very much important to give equal importance not only the products but also various department and customer satisfaction too. The services encompass wide diversified areas of trade, commerce & industry tailored to the specific needs of the customers and is distinguished by an exceptional level of prompt and personal attention. AIBL has already introduced some new banking products like credit card, ATM and swift etc which created attraction among the clients. The bank is going to introduce real time on-line integrated banking system, with all modern delivery channels etc at an early date. The bank’s services have always received appreciation for the warmth and hospitality typifying the rich cultural heritage of Bangladesh and have a set of landmark of achievement at home & abroad. It is observed that bank executives have little idea about their customer behavior, attempts should be taken to bring customers orientation in banking management. Training programs should be undertaken to develop the interpersonal dealings of Bank employees. It is unanimously expressed that customers expect better dealings from Bank executives. So it is necessary to provide quality of services to make customer satisfied. Thus, an organization can achieve its goal successfully. The internship program gives the student a great opportunity to get the difference and similarities between the practical and the theoretical world. A student can see a real picture of practical life after graduation and everyone should get the experience before entering the practical world. To prepare this report I had a great opportunity to have real life knowledge about how to evaluate the performance of a bank and make a comparison between Al-Arafah Islami Bank Ltd and other private sector banks.I also tried to increase my knowledge about banking activities and I think ,the information collected from different banks will help me to know the customer services of some other private sector banks. Knowledge when I was served. 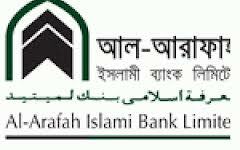 Procedure manual published by the Al-Arafah Islami Bank Ltd. Different reference books of the library. The financial statements were up to 2007,recent data were not published yet, Macroeconomic data are also unavailable after 2007. In 2010 total number of 1808 trainees were trained at training Academy through 44 training courses /workshop consisting of 223 working days. A total 7091 executives/officials have trained on different subject through 8 out reach and 615 “In-house training at Branches”. The numbers of officials trained in 2010 is 5 times of the total manpower of the Bank; That is, in this year each official has attended in an average of 5 training programs. In these programs training sessions were conducted by resources persons from Bangladesh Bank, BIBM and many other government and private Bank and financial institutions besides Bank’s own speakrs. As a general member of Bangladesh Institute of Bank Management (BIBM) 9 Officers and executives have got training from that institution on different courses in this year. At the same time, some other 25 officers and executives of the Bank have been trained in several training institutes including Bangladesh Bank Training Academy and others. with 78 online branches AIBL is committed to provide online facilities at any new branch that is added to the banks existing network . To keep pace with the growing customer needs as well as new technologies AIBL has taken a number of steps to facilitate clients while improving the existing services and adding on new services . The bank is striving hard towards the goal of changing from brick to click bank while taking banking services to the people who are not yet under the banking umbrella. has worked in tandem with Bangladesh Bank’s personnel to make the project successful and were among the first banks to successfully implement and comply to requirements provided by the Central Bank. With Allah Almighty’s grace AIBL’s IT Division has rose to the occasion and extended it’s all out co –operation to the central Bank in implementing the new projects under the DIGITAL Bangladesh theme. Clearing is now completely automated along with Electronic Fund Transfer. i. One passport Two stamp size-attached photograph duly signed by the acceptable introducer of the bank. vi. Photocopy of Trade License. Ð Disbursement from deceased account. Ð Prohibitory orders from court. absence of such a certificate, it would be advisable to return the draft for revalidation before payment. our country are not interested in involving Bank activities. 8. The telephone network of our country will have not been expended developed. Not adequate knowledge for the development of a decent Banking culture in the country.